All the glass is made here so you are likely to see some glass making in action on your visit. The work I create is always made from post consumer glass. This includes bottles, old windows or double glazed units, old shop shelving, old tabletops and tvs. I also avoid the use of virgin materials where possible when making moulds or using inclusions in glass. The reason for this is embodied energy! Being mindful that every material has a carbon footprint and that each management decision has an impact at a bigger scale. Glass upcycled from bottles is beautiful and there is no compromise in the quality of the product that can be created. And due to its technical limitations and its abundance, using waste glass provides a creative force. For glass, product life-cycle involves mining finite resources in an invasive way and using large amounts of energy to transport and to transform them into virgin glass. Whilst my choice to use only recycled materials is not going to change the world, it seems this way of thinking has the potential to make life more creative and fun whilst making a positive contribution to issues like global warming and ocean acidification. It's interesting to reflect that a small island like Tiree, of around 650 residents, can easily create enough waste glass to run a successful small business, adding value to waste and creating employment. Whilst bottle glass recycling facilities are widely available in the UK it is more difficult to easily recycle flat glass or TV glass. Recycling glass reduces the need to mine and transport sand, sodium carbonate, dolomite and limestone. These raw materials include carbonates that release chemically bound carbon dioxide. Melting glass from virgin materials is an energy intensive process, but reforming existing glass in a kiln is less so. Tiree Glass uses grid electricity and fires the kiln overnight to make use of off-peak power. At these times of low demand it is likely that this electricity will be supplied by ‘Tilley’ the grid-connected, community owned wind turbine. 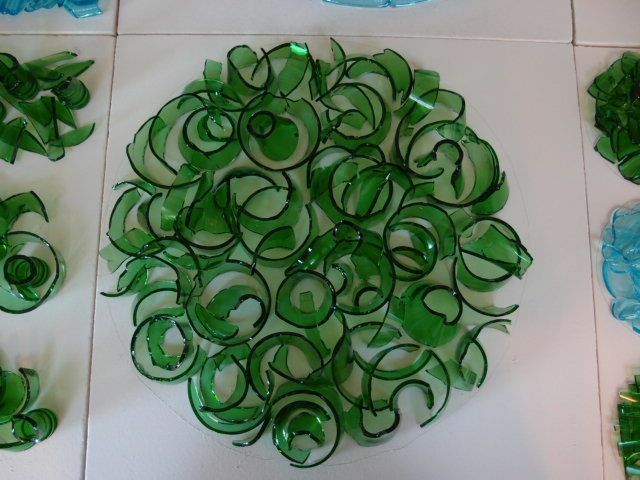 Making with recycled glass is different although the fusing, slumping and mould making techniques within the medium of kiln formed glass are the same. Upcycling glass makes things a bit more interesting as glass compatibility is a central concept when working with glass. The process starts by cleaning up the bottles and stripping windows from their frames. The bottles are then processed into flat sheets and carefully annealed to remove stress. After processing in the kiln the glass is no longer a bottle but a new raw material that can be cut into intricate shapes. Next the glass is assembled in the kiln for fusing and controlled cooling. Slumping is the process of shaping glass over a mould. This usually takes place as a separate firing at a lower temperature. Annealing is the process of strengthening the glass through controlled cooling. The annealing happens at around 500 degrees centigrade when the glass is beginning to return to a solid form. It is necessary to allow the molecules excited by the fusing temperature to become uniform again throughout the piece. Thicker or bigger pieces of glass take longer. The recommended anneal time for a 12 mm thick piece of glass is 2 hours followed by a 5 hour controlled cooling cycle. Working with recycled glass introduces constraints that limit and shape what is possible. Every bottle is potentially from a different batch of glass with different characteristics. Compatibility is determined by coefficient of expansion. This is the amount that glass expands on heating and contracts on cooling. It occurs at different rates in different glass and can make them incompatible with one another. Experience and regard for the constraints of working with recycled glass, along with careful design and conservative annealing increases the range of what is possible. The constraints are also a gift. They provide both limitations and direction! Moulds can be reusable ceramic, or one-trip plaster moulds for individual pieces. Carved vermiculite board or bricks can also be used to create reusable moulds along with a suitable primer/separator material. While colour availability is limited in recycled glass, creating form is unlimited. Surfaces that come into contact with hot glass need to be coated in a primer to prevent sticking. The ceramic kiln shelves are coated with a primer before each firing or a reusable dry separator can be used.